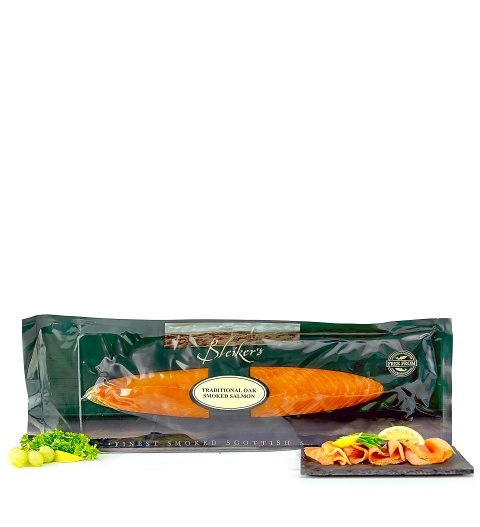 Artisan Oak smoked Scottish Salmon by Bleiker&apos;s, the finest Salmon to make Christmas! There&apos;s no denying the superior flavour of salmon over any other type of fish. The rich pink meat is as distinct in its appearance as it is in taste. Salmon is also known for its many health benefits which gives us all another reason to indulge more often! Spoil yourself or a loved one with this 1kg salmon hamper. Prepared by Bleiker&apos;s, your salmon comes wrapped in chilled packaging to ensure absolute freshness.